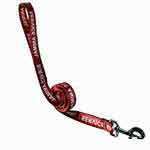 The bottom line is, it's a breeze for you to fly the friendly skies with your service dog! If you have your dogs in a row, that is. By that we mean you'll just need a few things to enjoy smooth sailing, based on the Air Carrier Access Act and recommendations of USA-based airline companies. The Air Carrier Access Act requires airline companies to allow for physically/emotionally impaired persons to be accompanied in the cabin of the aircraft with a service dog or emotional support animal and not be charged a fee. We have a few important links on this page that will point you to everything you might possibly need to know to make flying with your service dog easy and stress-free, no matter your destination! Don't miss them! 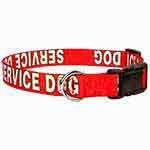 You'll need to be able to explain how your service dog assists you (that is, what task your dog is trained to perform for you) to the airline and/or Homeland Security personnel. If you're not sure how to answer, email or call us (866) 737-3930 and we'll help you prepare for that! 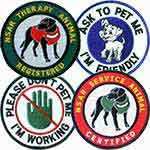 Although it's not required by law, airlines now ask that you have identifying patches, a vest on your dog (or its cage, if it's kept in one), and a service leash. 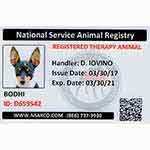 The same applies to an attached photo ID card identifying your animal as a service dog (from a credible agency like National Service Animal Registry). 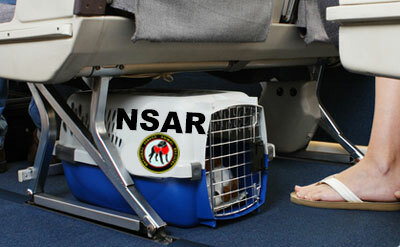 Airlines not only strongly recommend that you have ID cards, a service vest with patches, and a service leash, but our customers report that all USA-based airlines now recognize and often recommend using National Service Animal Registry (NSARCO). * When you have an official and documented service dog, the airlines are NOT allowed to charge you additional fees when your service dog accompanies you in the cabin of the aircraft. If you have the above items and your answers ready, it will be smooth sailing! Click here for what to expect at the airport and how to get through it without a hassle. 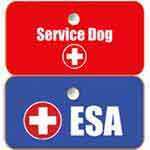 Click here for a comprehensive list of individual airline company requirements (for service dogs), their websites, and telephone numbers. Click here to read about the federal laws that apply to flying with your service dog - the Air Carrier Access Act of 1986. 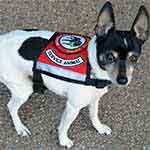 Click here to learn about travel to Hawaii with a service dog or emotional support animal. *Based on statements from clients.